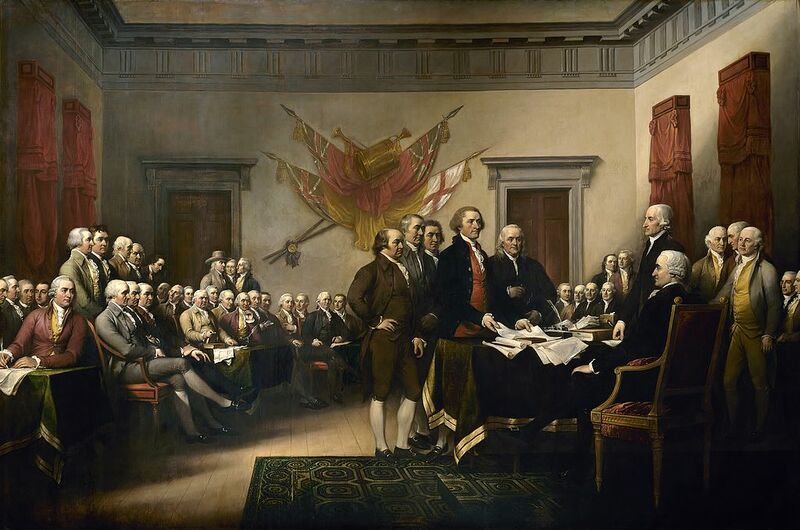 John Trumbull’s famous painting of the Declaration’s presentation hangs today in the Capitol Rotunda. It is owned by the citizenry of the United States. But aside from re-publishing that extraordinary document originally crafted by Jefferson, as I do below and I do each year, I wanted to take a moment to discuss tort “reform.” Because it is very much connected to our independence. The Declaration has, as its heart and sole, a discussion of how King George III seized too many powers. And the colonists believed — and were willing to risk their lives for the principles — that power should more justly reside with the people. As a conservative who reads, and immensely enjoys, your blog, I can offer one justification for believing in basic constitutional rights and tort reform. Much of what the tort reformers are trying to change is judge-made law, new causes of action, such as bystander injury, that might have been inconceivable to the Founders. You may disagree, but it is not an incoherent point of view. They are trying to use the legislative branch to change policies enacted by the unelected judicial branch. What is the justification among conservatives for one-size-fits all damage caps? Why should a government protect wrongdoers from being responsible for their conduct? Seems to me to be quite the fashionable reason theses days. Are you suggesting, Mr. Geezer, that there are some who would place profit (or perhaps a few campaign contributions) over political ideology? Sorry, but think there must be more to it, and I await a suitable explanation from conservatives. @Eric Turkewitz – How often does a jury determine who the “wrongdoer” is? Most cases settle, and they settle under the threat of an outlier verdict on a cause of action that may have been created by a judge. Damage caps are a legislative attempt to narrow the playing field, and the legislature certainly has every constitutional right to do that. Juries can determine the facts, but legislators can govern how the tort system functions. How often does a jury determine who the “wrongdoer” is? In any case where the parties can’t agree. Most cases settle, and they settle under the threat of an outlier verdict on a cause of action that may have been created by a judge. Damage caps are a legislative attempt to narrow the playing field, and the legislature certainly has every constitutional right to do that. My piece wasn’t about what was legally possible, but why some people act directly contrary to their political philosophy — in this case abandoning their ideas of a small, more restrictive government that leaves more power in the hands of the citizenry in favor of bigger, stronger government that grants protections and immunities. I think the apparent ideological inconsistency can be resolved. Conservatives favor small government, not legislation per se. Enacting a cap would not make government “bigger.” One can also favor jury trials of issues of fact, while opposing them for subjective purposes. “Just and fair compensation” does not have an objective, factual meaning. I also don’t think having judges sentence criminals violates the right to jury trial, for the same reason. This is my humble attempt to reconcile your paradox. Giving immunities and protections isn’t a seizure of power? And, by the way, if the wrongdoers aren’t accountable, who bears the cost? Answer: the victims and the taxpayers. Not to further any argument, but thank you, Eric for publishing this as an annual event. All too often I see portions of this document misquoted to pernicious purpose, or worse, conflated with The Preamble to the Constitution (!) for similar ends. Balderdash! Because I am a veteran and have joined some veteran’s organizations for various reasons, I am sometimes seen, for purposes of solicitation, as a political conservative in that regard. And so I get mailings and emailings along those ideological lines, assuming that I quite agree. Also balderdash! But often a fun read. Anyway, these sources are good for an annual pocket copy of The Constitution which, as far as I can tell, many of them have not studied. I far more appreciate the pocket guide on your rights to photograph in public, or the pocket guide from AOPA on your rights when accosted in your small aircraft for no apparent reason at an airport by the DHS and a local SWAT team, arms at the ready. Are we all reading the same document? Had I not already spent a lifetime in STEM pursuits, I might have studied History. It’s a fascinating subject and so often warped in modern times to serve the purposes of those who warp it. And, of course, this is true on the left as well as the right, but seemingly less often on the left (IMHO). But that could just be me. See? You can already tell I’m a lefty (in hand and in politics) because I admit of the possibility that I might be wrong. Gotta hand it to Eric — he gives no quarter. But it is absurd to say a settlement also settles who the wrongdoer was when the settlement can often cost far less than litigating. The defendant can’t choose not to pay that bill. And a $20 million birth injury verdict may seem mainstream some lawyers but it is hard to square with the facts in most cases I have seen. Hi Eric, your blog ranks quite well on Google! We hope to achieve the same at some point.